This lovely banner was created by AL! Welcome back to another week of Information Exchange! Hange and I are looking for some new Information, so will you help us out? This game is quite simple. Every week there will be a set specification of cards Hange and I will be looking for. All you have to do is find a card that meets these requirements and donate it! For that you'll receive 3 cards but you lose the card you donated, so make sure you don't mind giving it away! The donation reset will be Monday, January 30! This round ends Monday, February 6! The donation reset will be Monday, December 26th! This round ends Monday, January 2nd! Let's talk about... Food! Is there something you only eat during Christmas? Something you must have every Christmas? Something that's traditionally considered as Christmas food, but you might eat it all year? Christmas favorites? What food makes Christmas for you? Whatever comes to mind on Christmas + food, really, because apparently I'm talking about food a lot today / this month. For answering this, you can take choice card number 10 and you will also get 2 random crayons. No need to wait for me to give the card to you, just say what it is in your comment and log it! This game is open until December 31st! Hello, we're here again, so... Welcome back to Information Exchange! 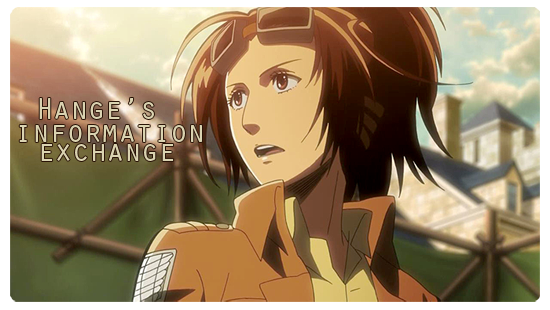 Hange and I are looking for some new Information, so will you help us out? The donation reset will be Monday, December 12th! This round ends Monday, December 19th! Congratulations to the winners of last month's Pot of Gold. Now that we helped the gods to learn about humans, it's time to help titan killers to get something else than giant problems to think about! You have until December 5th at 12:01PM CET to complete these tasks. Good luck! The next week of Information Exchange is up! Come on by and help Hange and I continue our search! Last week Smiling Nico-chan's choice was Let's go! Smile Pretty Cure! by Ikeda Aya from Smile Precure! The nine members of the school idol group μ's are having a karaoke competition! The song is picked by different member(s) each week to keep everyone excited and this way no one can cheat by learning songs that are easy for them! Can you guess which anime song they're singing this week? 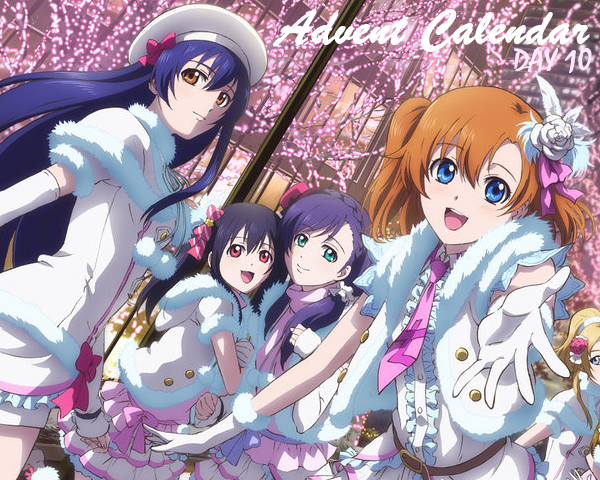 Tell μ's the song, performer and the anime it's from for 4 random cards! This round ends Sunday, August 23rd! Last week Maki's choice was Stargazer ~Hoshi No Tobira~ by Satori Negishi from Gundam SEED C.E. 73: Stargazer! This round ends Sunday, August 16th! The next week of Information Exchange is finally up! Come on by and help Hange and I continue our search! This post will close with the rest of the Colors League games on Monday, August 17 at noon GMT! Last week Rin's choice was ... something to be revealed later as the round is still open for one more day! This round ends Sunday, August 9th! Last week is still open until tomorrow! This round will end on Wednesday, August 5th! Last week Hanayo's choice was Kibou Ni Tsuite by NO NAME from AKB0048! The donation reset will be Monday, August 3rd! Last time Niou was Hikaru Shidou from Magic Knight Rayearth and Yagyuu was Yuchiro Hyakuya from Owari no Seraph! This round will end on Thursday, July 30th! Last week's answer will be revealed tomorrow! This round ends Sunday, July 26th! The donation reset will be Monday, July 20! This round ends Monday, July 27!